With Nikon D7100 you get more megapixel, bit bigger sensor, more AF points (19 vs 51) and 60fps in Full HD video mode (70D limited to 30fps only). Nikon D7100 base ISO is expandable upto ISO 50 – so you get more dynamic range in your landscape images, the HIGH ISO limit of both the camera is same (25600). 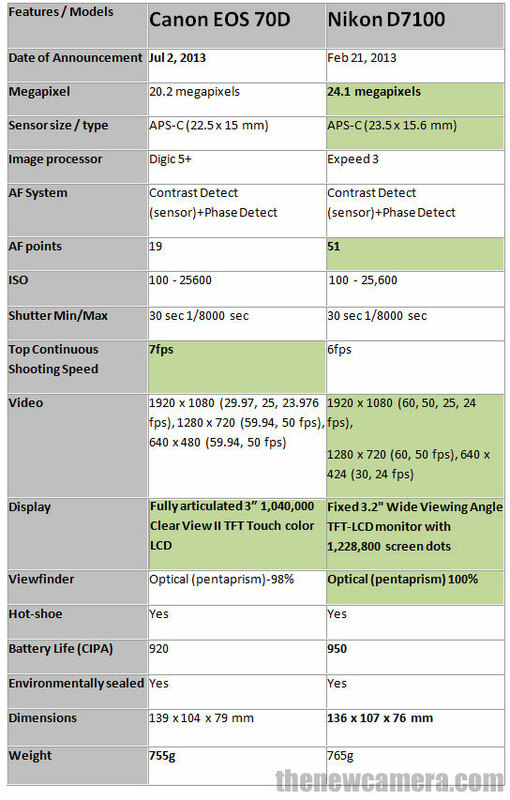 Canon 70D features newly developed Dual Pixel AF system that works five times faster compared to conventional contrast detect AF system in live view and video mode. With Canon 70D you can shoot 7fps for up to 65 JPEGs or 16 RAW files , but with Nikon D7100 you can capture 6-9 RAW files in a single burst. Canon 70D also features Touch and shoot var-angle display, Built-in WiFi, HDR mode and Multi Shot Noise Reduction mode. Canon STM Lenses Support: Canon 70D fast AF + silent STM lenses combination is a killer package for video recording. Canon 70D comes with cutting-edge technology, New Dual Pixel AF system, TOUCH and Shoot vari-angle display, WiFi that enables remote shooting and wireless file transfer in camera HDR and Multi Shot Noise Reduction mode. Nikon D7100 features more megapixel, more AF point and 60fps at Full HD. Verdict: Canon 70D is a excellent package and we highly recommend Canon 70D DSLR to our still and video shooters, however if you are a sports photographer, we recommend you to buy Nikon D7100 DSLR.